Ghosts, devils, and aliens have tormented man since the first consciousness thought. The sci-fi – religious – thriller, The Portal, follows Augustus Hobbes, an ex-Jesuit priest defrocked for heresy. A man who fails at everything he tries in the world outside his beloved brotherhood. As a tidal wave of insanity and violence threatens the lives of all around him, Augustus embarks on a desperate journey to uncover what it is he faces and to find a way to stop it. The Portal is an apocalyptic rollercoaster in which Augustus Hobbes, a modern Sherlock Holmes, attempts to save the world and himself from a demon that has been waiting for him since the beginning of time. For those of you who don’t have a kindle, there are two possibilities: download the free Kindle app for PC, Mac, and iPad from KINDLE APP and download the kindle version of THE PORTAL to your computer, iPad, smartphone, whatever else you might use. Use the paypal button below and purchase a PDF version. The PDF version has a few glitches but it’s quite legible. You should be directed automatically back to the download page on this site. If you are not, at the bottom of the receipt page on PayPal, you will see a link back to this site. Once here, you will see “Download The Portal” on the right side of the home page, click that and it will download very quickly. If you have any problems, let me know and I will take care of it. Thank you so much for buying my book. I hope you love it. “This is a story that starts quickly and then speeds ahead from there, taking us places we haven’t been before. There are locations I haven’t been to, characters that I haven’t read before, and all this towards an ending that is complex and simple, and as unusual as the plot. A page turner, a view of something secret, and Cruz is a character I hope to see again. I enjoyed this thriller/occult/sci-fi chase, and I recommend it.” Anna B. “A wonderful combination of a life’s experiences turned into a great story. You will love it and want some more from this author” Barbara W.
“A real page turner. I loved the relationships as they were developed. Interesting characters to get to know and follow.” Diane B. “The way the author describes the unfolding events and the emotional make up of the individuals is fascinating. Gr8 story line!” Robert R.
“Fabulous book right from the start. It continues to pick up speed and intensity as characters you begin to have feelings for are developed. So many parallels to the inner and outer battles humanity faces are weaved quite nicely into the storyline. Thanks to the author for persevering through all the challenges of getting this piece of work into the readers hands. 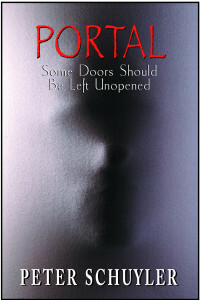 Bravo!” PJ W.
“The Portal is an engaging, easy read that made me want to keep reading way past my bedtime. The characters are so fully developed that I feel I know them personally. Their emotional lives became part of mine. The story, while unusual to say the least, is fascinating, weird, moving, disturbing, funny… in a word, entertaining. The Portal is worth the time and money.” Karin W.
“Peter Schuyler has done the impossible. Knowing how I dislike sci-fi he got me to read and ENJOY his sci-fi thriller “The Portal”. It grabs you by the throat on page one and doesn’t let go until… Don’t worry, Mr. Schuyler, I ain’t givin’ nothin’ away! So, if you hate sci-fi as much as I do, come out of the shadows and for a great summer read (and winter, too) order your copy of “The Portal”. First, it’s populated by REAL people. Characters you can identify with and care about and root for. Second, it’s creepy, enough to make you squirm while reading. Third, it’s mysterious. And who doesn’t like a good mystery. And, finally, there’s the sci-fi part. But, like I said, don’t worry, Mr. Schuyler, I ain’t givin’ nothin’ away! Read it. Enjoy it. Then, don’t thank me, thank the creative, fertile, ingenious mind of one Peter Schuyler.” Ken R.
“Can’t wait to see where Peter goes next time creative page turner,Great writing he has done his homework. Buy one now.” Trudy S.